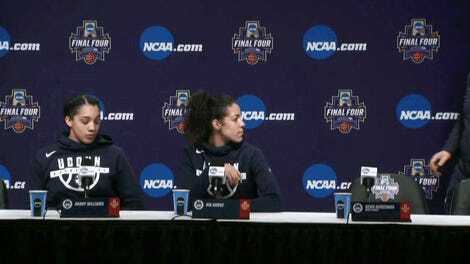 Both women’s Final Four games went to overtime tonight, with UConn keeping its undefeated season alive thanks to an incredible meltdown by Notre Dame in the last seconds of regulation. Fighting Irish junior Jessica Shepard threw the ball away after a three-pointer with 15 seconds remaining, allowing Kia Nurse an easy layup to tie the game—with Shepard turning the ball over again moments later, though the Huskies were unable to put the game away, even if you believed in your heart they would, because how couldn’t they? UConn finishes its season 36-1. Notre Dame will face Mississippi State for the national championship.